It is an odd way to be in Montana. 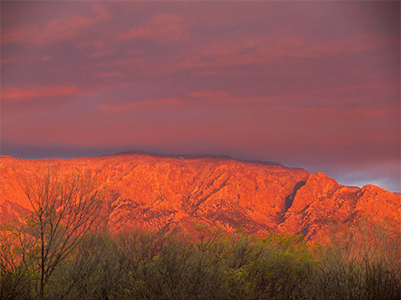 To be here, and to be writing about Sandia Mountain, New Mexico. To be locked into a schedule that has kept me at my computer for six weeks, thinking about Sandia. Or reading about Sandia. Or talking with various experts about Sandia. 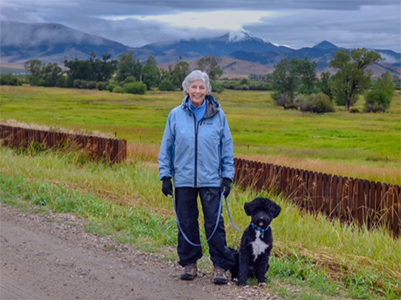 We arrived in Montana later than usual, so that, in spite of the heat and the flowers, the summer seemed gone to me. Maybe any season seems gone if you don’t catch its beginnings, its urgings toward its own fullness. By only getting the fullness, I felt I had missed something. That’s probably why vacations seem irrelevant to me. You go somewhere for a short time and you miss whatever happens to the place. Maybe it’s possible to get by in Paris or New York or Athens, although cities have their seasons, too. In all of my life in NY, I always treasured the moment the season changed. And it was a moment. In one instant it was winter, then, suddenly, there were the pale beginnings of blossoms on the trees, the delicate greening. It happened overnight, the same way seasons change in Montana or New Mexico. Overnight. Everything happens overnight. Miss that, and you miss the meaning of change. Maybe the “meaning of change” is as irrelevant as vacations. What matters is change itself, not its meaning. Why define what is the one constant on earth? Spend time defining change and you miss it as surely as I missed the beginning of summer in Montana. It was too late, by the time we arrived in mid-July, to put flowers in pots on the front porch as I usually do. The nursery still had flowers, but between my need to get started on the Sandia book, and my petulance, there was no time for planting, for arranging, for admiring. There was only time to sit at my desk and go to work, only time for early morning walks with the dog, only time to watch him see his first cows. Black Angus. Luke sat down in the road to study them. He deals with everything new the same way. He sits down and watches. He is perfectly willing to take the time that things require. He doesn’t know we arrived too late, or that I’m in Montana writing about New Mexico, or that there hasn’t been time to hike these mountains I love, while writing about the mountain I see from my window in New Mexico. None of these things matter to him. So why should they matter to me? How can I feel so great an urgency of time, when time is the one thing that is always present? Why am I discombobulated by missing the change of a season, when the season changes whether I am present or not? Why use my energy bemoaning the absence of a moment in my life when that moment happens with or without me? How can I miss the meaning of change when everything is always changing? The light in the sky. The shape of clouds. The wind through the grass. I am in Montana, missing Montana because my energy is directed toward Sandia. 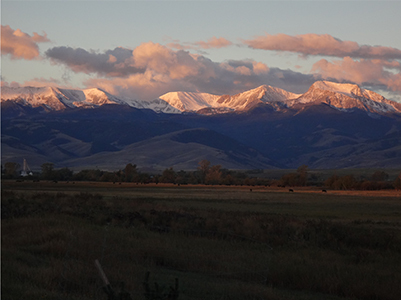 But Montana exists, whatever it is that occupies my time. And Sandia exists even though I don’t see it from my window. My dog exists and studies cows. The early morning road exists. Why do I not see that my way of being present to Montana this summer is to be at work? Montana has always fed my writing. Home of my soul, it offers me subjects and opportunities, landscapes, dreams, action, possibility. Given the distractions of the Montana sky, it demands discipline. Have I lost that discipline, substituting for it complaint? I need to watch Luke as he studies cows, concerned only about the fact of these animals on the far side of the fence. And I need to acknowledge that I’ve been present to summer’s turn to autumn. It is an autumn light now that holds us. The sun is lower, the air crisp, the smell of earth different. The morning of August 23rd, we awoke to new snow on the Tobacco Roots, a cold, northern air surrounding us. I think I’ll stop complaining. I have everything I need.